The weekend started with a quiet bang. Saturday was lovely ~ an invitation to walk to Zeke’s, sit outside and enjoy a new-to-me latté (made with lavender spice and honey). After one sip, a gust of wind, caused my drink to spill the minute I sat it down! The barrista was kind enough to make me another and I switched to a caramel latté – I found the first drink a tad too sweet. Easter Sunday we joined friends for a delightful, delicious potluck dinner. The evening sunset was spectacular. I am so delighted that today’s smart phone technology makes taking such dramatic photos as easy as can be! Today beckoned me outside once again: Come. Take a long leisurely walk to the park. I enjoyed not only the weather and sight of the sky, folk reading, kids playing, flowers, azaleas and trees blooming, and also the sidewalk art, always a delight to see. Lovely memories of a lovely weekend. Ah! Spring! …despite a taste of every kind of weather in the span of one hour…guess that’s Mother Nature’s sign that Spring is indeed, just around the corner! Here’s to Monday and Spring! decide whether to hand or machine stitch the back side of the binding. …on the reading front, I finished Gretchen Rubin’s Outer Order Inner Calm. This is a quick read – just 215 pages filled with all sorts of pithiness – and one I think/expect to read more than once, again, soon! I was amused when I read the suggestion, p.18: “Use technology to clear clutter. ” Gretchen asks: “Why hang on to possessions replaced by technology? and then states … “(Though it does seem like sacrilege not to own a physical copy of a dictionary.) I so agree! Time for me to create some order at my workstation, take a walk and listen to Gretchen’s latest Happier podcast, bury some threads on the convergence quilt and tackle a few more items on my list. No time to procrastinate! Joining Kat and friends here! This is a long tale…of woe, I ‘spect. My mother was in a Tom Thumb wedding when she was five years old; as part of the event, she was given a gold band. As she grew older, she wore the band on her pinkie finger and when she married, it stayed there, next to her thin gold wedding band. As a child, I coveted that Tom Thumb ring…I don’t think she could’ve removed it, had she been so inclined. Fast forward to early 80s; I found a pinky gold band that was shaped much like a lower case h – with a small diamond in the upper portion of the letter. Of course I bought the ring and wore it too on my left pinky finger. I eventually had the diamond removed for it often got snagged. I had the ring for nearly forty years – wearing it mostly when I was out: working; socializing; etc. Yesterday, I joined friends for our Thursday stitching gathering and on the way home made a couple stops, one at a small shopping plaza. As I was walking the halls to get to my car, I looked down at my left hand and realized I didn’t have on my ring! I retraced my steps: I’d gone to Joann’s and the grocery store for bananas, apples and a container of Panera’s broccoli cheese soup (sooo good!). A look and inquiry in both places turned up not-a-thing! I drove home, thinking, hoping that perhaps I’d not put on the ring. Alas, that was not the case. The ring was not in my jewelry box. I searched my purse and the basket of knitting I’d taken. I searched the pockets of the jeans and shirt I wore; my coat pockets. I even searched the plastic bags that held my purchases. I searched through every thing, many times over. To no avail! My friend- in whose home we gathered – even searched her couch, moving the pillows and looking underneath. Zilch. Da nada. I am slowly coming to terms with my lost ring. I know that I can always get a replacement of some sort, if I so choose. I am grateful that the ring was not my mother’s from the Tom Thumb wedding. Had that been the case, I imagine I’d be a bit inconsolable today. As the sun sets – and it was pretty dramatic this day – I am feeling a tad better; it helps for me to voice, acknowledge my feelings. Know that I appreciate beyond words your support. I have learned over my years of living that life does go on and I am grateful for each day I’ve had; even the one where I’ve lost my ring. Have a wonderful, preferably non-weather-event- weekend! My quilt group meets weekly on Monday. 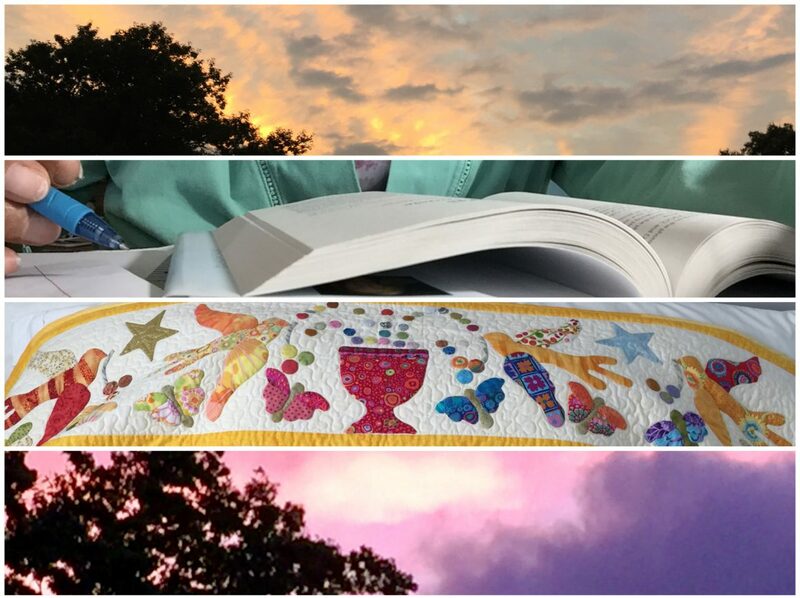 At the end of each meeting, we have show-n-tell, an informal sharing by members of their recent quilting projects . This is a photo of quilted mandalas; I have a secret love affair with mandalas. Occasionally, I color one or try to create my own design. When I saw these, I knew I wanted to add making one or more to my someday maybe quilt project list. I chatted with the maker of these and asked her to send me a reference to the magazine and instructions, if she still had them. She did and left me a message last night. Hmm, I thought, I think I might have that issue… and by golly, I do! I think I bought it before Christmas, skimmed the issue and marked the article to read/try later How about that for a bit of serendipity? Today, I took a long walk – the first in days. I was on the lookout for forsythia; too soon…but I did see #blueskybuds ! And that made my heart sing! What signs of spring have you seen? The quilted fleur de lis I made in honor of my mother two years ago; I shibori dyed the fabric and hand stitched the iris. Birthday greetings for Elias who will celebrate his first birthday Tuesday, 27 November! Big Brother Chris … Elias’ hero! We are all eternally grateful that our Thanksgiving 2018 includes Dolly and Elias. Here’s to many more celebrations! PS. Today has been a quiet, PJ day for me! I’ve always enjoyed piano music, especially classic. For sure, Mozart is my favorite composer. Any/Every time I hear his work, I am stopped in my tracks, transformed somewhere else. As a child, I aspired to play an instrument and in 4th-5th grades, chose to learn the piano. Well, that was short-lived: I never did. Why? Because a) I didn’t practice and b) never bothered to learn the bass cleft. Kinda necessary to play the piano or any instrument, I imagine. You think? On Friday, during my Journal Club session, I was introduced to a new pianist : Ludivoco Einaudi and his piece: Walk. I am listening to it now, as I write this post …and I invite you to click on this link. It is hauntingly beautiful and a visual as well as an auditory experience. There is quite the library of videos of his performances. I am so grateful that I have a new companion to accompany me on my walks, when I journal and during other mindful moments.